The 1973 Aquarius Festival was produced by the Australia Union of Students and it was a peak expression of the creative cultural ferment which arose with the anti-war, anti-conscription, student activism of the late 1960s and early l970s. The Aquarius Festival brought to Nimbin student and counter cultural activists from all across Australia. 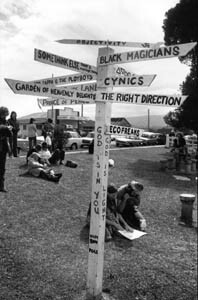 The isolated rural village of Nimbin was chosen as the festival site because it was far away from the urban and campus structures and symbols which had been the objects of so much student protest. The years of protest had made clear what students of that era were against: imperialism, sexism, racism, authoritarianism, industrialism, consumerism and progress at any price. By 1973 Whitlam had been elected and for Australians, the war was over. Our protest had been won. In Nimbin we gathered to ask "What are we for?" and "What future do we want to create for ourselves?" It was called a Lifestyle festival - a Survival Softlick - and visionaries, prophets and social activists came as tribes and networks of friends to live and share their visions. The cutting edges of many cultural changes were represented there. There were conservationists talking ecology, healers offering wholistic medicine and rediscovering herbs and acupuncture, architecture students and engineers talking about low energy consumption and appropriate technology, post-Illich educational theorists talking de-schooling, foodists offering new diets, bakers offering wholemeal bread, kooris talking land rights, psychotherapists talking about growth and human potential, food co-operatives, videots, alternative media and an array of gurus, guru followers and seekers of spiritual truths. All this and troubadours, shamans, tight rope walkers, dancers, ecstatic singers from the East and soul rhythms from Africa, easy sexuality and drugs to open the "doors of perception". The Festival astonished us. It was a brave new world of wonder, ecstasy, creativity and goodwill. Here were our dreams and anything seemed possible to us. It was as if some great doorway in our hearts and minds had opened. It opened only a fraction and only for a moment and we were seared by a light which streamed through and illuminated our lives. We glimpsed how things would and could be. We saw our future. And we were changed forever.